Thanks to the WikiReader, I am the smartest person in the room. I got a chance to try out the Wikireader that we reported on earlier, and I will have to say that I am now the know-it-all. I’ve become like Cliff Claven from Cheers, who seems to know all the useless facts in the universe, and comes off as amazingly annoying. 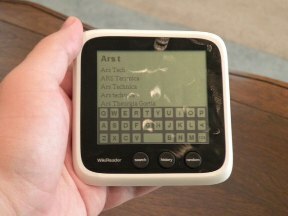 The Wikireader by Openmoko is a device with a tiny black-and-white screen that uses 2 AAA batteries that are included. It requires no internet connection as all the 3 million entries are inside. 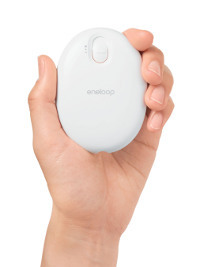 There are no illustrations, and the touchscreen allows for scrolling. Scrolling up and down creates a blurry effect that makes it easy to lose your place. Find out after the jump how Cyber Monday got its name. Read moreThanks to the WikiReader, I am the smartest person in the room. Surely this was the mission of the Talking Luggage Locator, because that is exactly what it is. 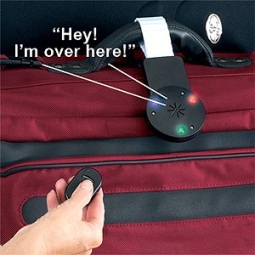 It works by attaching a baggage tag with 6 flashing LEDs. In all honesty, the flashing LEDs would be enough to get my attention, and I would probably find it right away. It helps to have a remote that works from 45 feet away so my own voice can say something else like: “Yo! You gonna grab me?” You can just imagine the cacophony in the baggage claim if every passenger had one of these.